Successfully Added Preorder Bluboo Mini Smartphone - 4.5 Inch Display, Quad-Core CPU, 256GB External Memory, Android 6.0, 1800mAh (White) to your Shopping Cart. The Bluboo Mini smartphone shows us that bigger is not always better. Although small in size this mini smartphone packs some decent hardware that lets you smoothly get through the most demanding of days. Its extremely compact design features a beautiful 4.5 Inch display, allowing you to enjoy your favorite media and to browse the web at any time of the day. Available now at with a remarkably low price tag, this Chinese smartphone comes with an abundance of features and is the perfect device for smartphone users of any age. Running on an Android 6.0 operating system this Android phone is guaranteed to offer a smooth user experience that brings along the latest features the mobile industry has to offer. Its powerful Quad-Core CPU that has been clocked at 1.5GHz is capable of running demanding games, movies, and the latest applications without dropping a frame – allowing you to enjoy the latest media without dropping a frame. Along with a Mali-400MP graphics unit, this 4.5 inch smartphone offers vivid colors and great detail, further enhancing your overall smartphone entertainment experience. With the availability of a stunning 256GB of external storage, you can be assured that there is always enough space for you to save all your media, games, files, and more. Featuring Dual-SIM and Dual-IMEI numbers, the Bluboo Mini allows you to stick in- and be connected too- two SIM cards and network providers simultaneously. Not only does this allow you to be reachable on two phone numbers at the same time, it also gives you the possibility to be connected to two network providers thus magnificently increasing your global data coverage. The possibility for people to contact you on two separate numbers while you are using just one device, makes the Bluboo Mini a perfect smartphone that can be used to efficiently separate your work and private life. At the rear of this affordable smartphone you can find a 5MP camera that allows you to snap nice pictures, ensuring that not a single moment in life ever gets forgotten again. Additionally, its 2MP front snapper offers the perfect little camera to take selfies and furthermore lets you make detailed video calls with all your friends and loved ones online. Coming with an 1800mAh battery you can be assured that plenty hours of usage time are waiting for you – letting you enjoy all your media, online video calls, and favorite games for hours in a row without needing to fear about battery life. 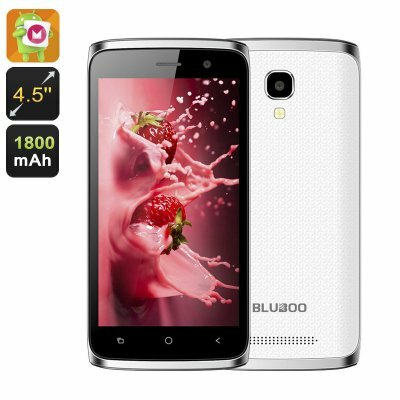 The Bluboo Mini smartphone comes with a 12 months warranty, brought to you by the leader in Chinese Smartphones as well as wholesale electronic gadgets..